Whether it was fatigue from playing their fourth game in six nights or the Hornets’ slower, half-court style, the Pacers didn’t look like themselves most of the night. After Oladipo made a 19-footer with 9:50 to go, the Pacers didn’t look back. 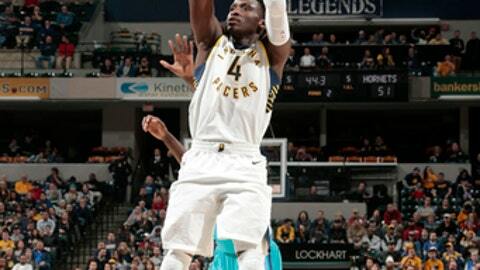 Sabonis scored Indiana’s next five points and when the 13-4 spurt ended with Sabonis’ 20-footer, the Pacers led 94-86 with six minutes remaining. Then Turner’s 3 spurred a 7-0 run, giving the Pacers a 103-89 advantage with 2:46 left. Charlotte never recovered. ”Their defense was really good and we didn’t respond well,” Hornets coach Steve Clifford said. Hornets: Howard dominated the first half, scoring 18 points on 8-of-11 shooting and grabbing seven rebounds. He wound up with the 697th double-double of his career. … The Hornets were outscored 40-21 off the bench and were just 9 of 31 on 3s. They also had 16 turnovers. … Charlotte has lost three straight and 14 of its last 16 in Indianapolis. Pacers: Young has scored in double figures in 12 consecutive games. … Indiana shot 54.2 percent from the field and improved to 18-0 when shooting 50 percent or better this season. … The Pacers had a 54-42 scoring advantage in the paint. Neither team led by more than six through the first three quarters. ”I just played,” he said, noting he didn’t get much of a chance Saturday because of foul trouble. Batum also acknowledged he’s rounding into form, too, after missing the first 12 games with a torn ligament in his left elbow. ”Injuries have been tough for me, so it feels good to be getting my shooting back,” Batum said after going 8 of 17.